UP ITI Instructor Recruitment 2018 Vacancy in Government ITI College 3000 ITI Anudeshak Bharti Latest News UPSSSC ITI Instructor Recruitment 2018 Last Date. UPPCL Office Assistant Recruitment 2019 Latest News 2523 UPPCL Office Assistant Upcoming Recruitment 2019 Stenographer, Power Corporation, UPPCL Office Assistant Latest Recruitment 2018. Bombay High Court Clerk Recruitment 2018 Apply Online for Latest Govt Jobs Opportunity to fill 8921 Vacancies of 4738 Junior Clerk Recruitment in Bombay High Court. Before Applying Online One should have proficiency in Marathi Language. 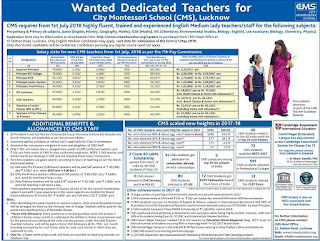 CMS Lucknow Recruitment 2018 Application for Appointment of Teaching / Non-Teaching Staff. 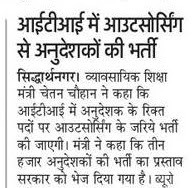 CMS Lucknow Teacher Application Form to be filled only in applicants own handwriting. UP Sanskrit School College Recruitment 2018 Apply Online for Latest Government jobs in Teacher, TGT PGT, and Lecturer 9,000 vacancies to be filled. For More details of UP Sanskrit Inter College Bharti regarding Age Limit, Selection Process and Eligibility are given below. 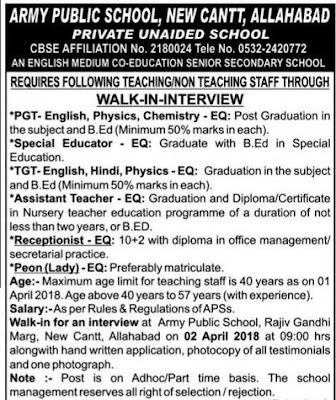 Army Public School Recruitment 2018 Vacancy in Allahabad TGT PGT PRT Part time Govt Jobs Latest News Army Public School Allahabad Recruitment 2018. 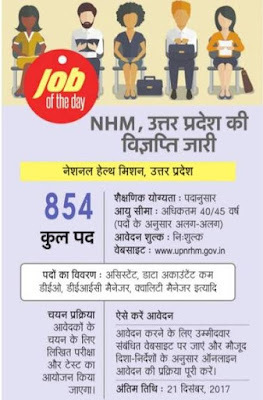 NRHM UP Vacancy 2018 Apply Online for getting Rs 35,000 Per Month salary given National Health Mission Uttar Pradesh as 989 Staff Nurse,Doctors in Community Health Officer. NIMHANS Recruitment 2018 Latest Jobs of Staff Nurse & Associate Professor in Neuro Science Dept NIMHANS Professor Recruitment 2018.